New information casts doubt on one of alternative Egyptology's boldest claims: that the Sphinx had nothing to do with Khafre. When Pharoah Thutmosis IV fell asleep before the head of the Great Sphinx at Giza, he recorded that the statue had spoken to him in a dream. He said the Sphinx had told him to clear away the centuries of sand that choked its body and hid all but its head from view. The Sphinx then promised the young Thutmosis (also spelled Tutmosis) the throne of Egypt for doing this work. 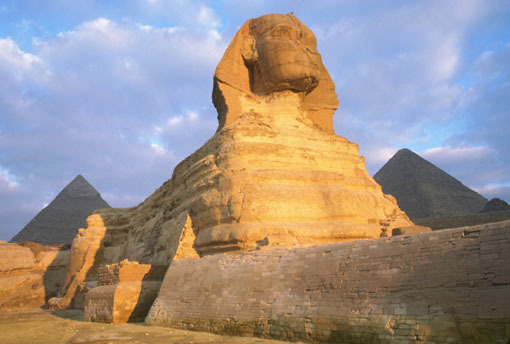 And so he cleared the Sphinx of its sand and set up between the massive lion's paws a stela on which he recorded his dream and promised to restore the statue of the Pharoah Khafre. Or did he? Archeaologist Michael Brass says "West said to me he couldn't supply any names because they hadn't paid attention and gotten names. Yet he still continues to claim this anonymous support, which cannot be tested, and to say these names can be provided." As of June 2001*, West had not supplied any of the 250 names he claimed supported the water-weathering hypothesis, but a few scientific journal articles have appeared both for and against the West-Schoch theory. * As of today, this situation had not changed.